No visit to downtown San Diego would be complete without exploring the city’s Embarcadero at the waterfront. It’s home to the oldest iron sailing ship afloat, world-class harbor tours aboard a spectacular Hornblower yacht, superb restaurants with spectacular bay views and the fascinating historical Maritime Museum. Here too is the must-see USS Midway Museum as well as the enchanting Seaport Village. It’s a-turn-of-the-century re-creation of a waterfront village filled with shops and restaurants. The Embarcadero is a flat one and three quarter mile long walker’s, jogger’s and bike rider’s paradise. And whatever you do, don’t miss taking a harbor cruise! Seeing the city from the water is an attraction second to none. The best harbor cruise company you’ll be looking for is Hornblower Cruises & Events (2) (619-686-8715). It’s located at 970 N. Harbor Dr. at the Embarcadero. They offer both one-hour ($25) and two-hour ($30) harbor cruises, and they have six two-hour tour departures daily with seven in the summer. Senior citizens 55 and older and military receive $2 off; children 4–12 are half price; under 4 are free. No less spectacular is Hornblower Cruises & Events seasonal whale and dolphin watching adventures. Locals as well as out-of-towners love these ocean adventures. But the one that takes the cake is their fabulous nightly dinner cruises and their excellent champagne brunch cruise. 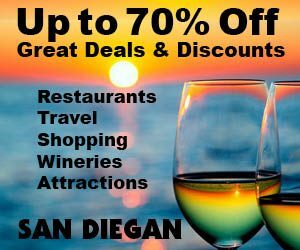 Use their coupon in this website for $5 off their happy hour cruises, harbor cruises, dinner and champagne brunch cruises. See Sports & Recreation and Restaurants. Next door to the north is the B Street Pier (10), which is San Diego’s international cruise ship terminal. This is where beautiful cruise ships dock. More than 100 cruise ships pass through here each year! This vast expanse of cruise ships visiting San Diego can be attributed to the wonderful job the San Diego Port District does. For more information on the cruise terminal and cruise ship arrivals and departures, call the San Diego Unified Port District (619-686-6342) or visit their website at portofsandiego.org. While it’s fun to see the sights on foot it’s even better to see the vastness of the Embarcadero by bike or cruising on a cool Segway led by a knowledgeable guide as you cruise along the waterfront. For your convenience San Diego Segway Tours by Wheel Fun Rentals (9) at 1355 North Harbor Dr. (619-342-7244), is ideally located across the street from the cruise ship terminal. It’s open daily from 9 a.m.–sunset every day of the year. They now have a location at the Marriott Hotel (18) as well. See Sports and Recreation. See their coupon to receive $20 off. If you are closer to Seaport Village, they have a second location next to the Marriott Marquis Hotel. This location of Wheel Fun Rentals (16) is at 333 W. Harbor Dr. (619-342-7244) and it’s also open seven days a week from 9 a.m.–sunset. Being the undisputed leader in bike rentals the array includes cool surreys, bikes and of course stand up Segways, which everybody who rents one wants to own one. Our coupon gets you 1 hour free after you buy 1. See Sports & Recreation. The Maritime Museum of San Diego (1) at 1492 N. Harbor Dr. (619-234-9153). The fascinating floating museum at the Embarcadero consists of historic ships and two submarines: The Star of India, which is the oldest active sailing ship in the world, the steam ferry Berkeley, the steam yacht Medea, the San Diego Harbor Pilot, also an active Soviet-era diesel B-39 submarine and the deepest-diving submarine ever, named the USS Dolphin, among others. You will also find two replica ships, one is a detailed re-creation of a 24-gun British frigate named the HMS Surprise, the other is a 145-foot long ship the Californian, the official tall ship of the State of California. You can go aboard and explore these historic ships. Admission is ($16) adults; ($13) seniors 62 and over, students 13–17, and active military; ($8) children 3–12; children under 2 are admitted free. For only ($5) more you can enjoy a 45-minute bay cruise aboard the Pilot. Also, you can now sail aboard the Californian ship. The sailing schedule and package prices are available online [sdmaritime.org]. They include weekend afternoon cruises and summer trips of 3 to 7 days to Catalina and the Channel Islands. Be sure to redeem their discount coupon in this book for $2 off admission for up to four people! Open daily 9 a.m.–8 p.m. and in Summer until 9 p.m. See Sports & Recreation. South of the foot of Broadway Pier along Harbor Drive are more attractions galore. You’ll see eye-catching skyscrapers, high-rise hotels and luxurious condos that reflect the glimmering coastal sunsets and a whole lot more.Whatever you do, don’t overlook the opportunity to experience the magic of the USS Midway Museum (5) at 910 N. Harbor Dr. (619-544-9600). It’s the world’s largest floating naval museum. Admission includes a self-guided audio tour, where you’ll learn about the USS Midway’s fascinating history. On the flight deck are historic military aircraft like the ones that landed on this aircraft carrier. From the 4.02-acre flight deck you’ll have a stunning view of the downtown skyline and San Diego Bay! Below deck explore the city at sea, which is a fascinating re-creation of life aboard an aircraft carrier. The museum is open 10 a.m.–5 p.m. daily (closed Thanksgiving and Christmas). Admission is ($20) for adults; ($17) for seniors 62 years of age and over; ($15) for students ages 13–17 years of age with school ID; ($10) for retired military with valid ID; ($10) for youth ages 6–12. Active-duty military and children 5 years of age and under are admitted free. Be sure to use their discount coupon in the SAN DIEGAN for a free youth admission with one or more paying adult. See the Historical Museums chapter. Literally next door to the USS Midway Museum is the Embarcadero’s most iconic restaurant. It’s The Fish Market (6) (619-232-3474) at the foot of G Street. 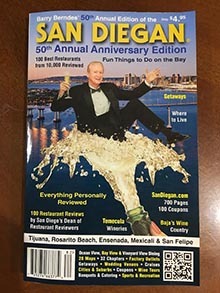 Plus, it was awarded the prestigious Gold Medallion Award designating it the best seafood restaurant in San Diego by the San Diego Restaurant Association. This impressive, casual, bay front seafood restaurant also has a sushi and an oyster bar, as well as a fish market in the foyer. You’ll be impressed with their 100-plus-item seafood menu. Upstairs is where you’ll find their gourmet seafood restaurant called Top of the Market (619-234-4867). Its rich setting features spectacular views. Dine inside, on their patios or on the stunning deck area and enjoy a meal to remember and a wonderful bay view. Both restaurants are open daily from 11 a.m. See Restaurants. Military aviation buffs should also visit The Flying Leatherneck Aviation Museum on Miramar Road (858-693-1723) [flyingleathernecks.org]. It’s all about marine aviation history. Admission is free. See Historical Museums chapter. A restaurant that comes with high marks for its commitment to naval aviation is Kansas City Barbecue (7), located just two blocks from the USS Midway Museum at 600 W. Harbor Dr. (619-231-9680). This restaurant, which has been in business for 34 years, is downtown’s most notorious barbecue restaurant. Besides its great-tasting food, its claim to fame is that scenes from the 1986 hit movie Top Gun were filmed here. Get your souvenir Top Gun t-shirts and hats here! This is a great spot for happy hour, which is daily 3:30 p.m.–6:30 p.m. and 11 p.m.–1 a.m. See Restaurants. Also calling the Embarcadero home is Seaport Village, the immensely popular specialty shopping center with excellent restaurants and shops to discover. It’s just south of The Fish Market Restaurants. You’ll also find a new shopping and dining alternative called the Headquarters (16), which is just in front of Seaport Village. See their walking tour at the end of this chapter. To the east of Seaport Village is the Manchester Grand Hyatt Hotel (16) at 1 Market Pl. (619-232-1234). Besides its ideal waterfront location, it’s also home to Sally’s Seafood on the Water Restaurant. Farther south is the San Diego Marriott Marquis & Marina (9) at 333 W. Harbor Dr. (619-234-1500). Its waterfront location makes it the perfect destination for business and leisure accommodations. And literally next door is the world- renowned San Diego Convention Center (12) at 111 W. Harbor Dr. (619-525-5000). It hosts conventions, trade shows, meetings and special events of all sizes. Perhaps most notably is Comic-Con International: San Diego, which has grown to an annual attendance of over 130,000 comic book enthusiasts in recent years. The center has 1,950 underground parking spaces and several floors of meeting space. Tucked behind the immense San Diego Convention Center is the picturesque Embarcadero Marina Park South. Here too is Joe’s Crab Shack (17) at 525 E. Harbor Dr. (619-233-7391). Plus, if you attend Summer Pops, this is a popular place to dine. The park is also home to a wonderful San Diego summer tradition, Ashford University Summer Pops (11). For 10 weeks each summer, the San Diego Symphony performs its Summer Pops Concert series outdoors at Embarcadero Marina Park South on picturesque San Diego Bay. The Summer Pops features a wide variety of musical entertainment including Broad­way, Motown, pop, rock and country. This summer’s headliners include Wyonna Judd, Herb Alpert and Alain Hall, Leslie Odom, Jr., Tony Bennett, Air Supply and more! The series begins with the Star Spangled Pops and ends with the 1812 Tchaikovsky Spectacular on Labor Day Weekend, both concluding with fireworks. There are also fireworks at the conclusion of each Sum­mer Pops concert on Friday and ­Saturday nights throughout the summer. Seating includes Champagne, cabaret tables, grandstand and lawn. Summer Pops ­concerts begin at 7:30 p.m. Tickets are ($20–$90). For more information or to purchase ­tickets, please call the box office at (619-235-0804), or visit [sandiegosymphony.org]. Fifty yards south of The Fish Market Restaurant is Seaport Village (13). Celebrating 33 years, this one-of-a-kind attraction consists of more than 70 fascinating little shops and charming bayside restaurants, live entertainment and beautiful bayfront scenery all in one place. This turn-of-the-century, re-created, waterfront village is ideally located in the heart of downtown San Diego’s Embarcadero at Pacific Highway and West Harbor Drive (see map). It’s just a short walk from the San Diego Convention Center, luxurious condominiums and high-rise hotels such as the San Diego Marriott Marquis & Marina and the Manchester Grand Hyatt. Seaport Village is an enchanting re-creation of a time gone by. Expect to see street performers as well as friendly face painters and local sketch artists. Seaport Village hosts many festivals, special events, weekend concerts and ­holiday activities (619-235-4014). It’s also a favorite viewing spot for the 47th Annual San Diego Bay Parade of Lights each December. All of the shops in Seaport Village are open daily 10 a.m.–9 p.m., and in the summer (June through August) most store hours are 10 a.m.–10 p.m. They are even open on Thanksgiving Day and Christmas Day, 10 a.m.–6 p.m.
Also, with a $10 minimum purchase in any Seaport Village store, you can park for ($5) for three hours. After that there is a fee of ($3) every 30 minutes or part thereof. For a spectacular bay view of San Diego’s beautiful skyline, especially at night, majestic Harbor Island is the place. This picturesque pleasure isle is centrally located on San Diego Bay and is easily accessible. Plus, it’s only three miles from downtown and directly across from the San Diego International Airport.